Braxton Garrett has already done several great things on the diamond. He posted a 0.54 ERA while striking out 131 batters in 65 2/3 innings as a senior at Florence High School in Alabama. He won a gold medal in Japan with Team USA. He was drafted seventh overall by the Marlins last June, the highest pick of an Alabama high schooler since 1971. And yet on Monday, he had just one thought. "Just get the past the first inning, and things will be a lot easier, that's what everyone told me," he said. "I was a little nervous, but I was trying to not let it affect me. Once I got in the dugout after the first inning, it made a big difference. I was just so excited to compete." Garrett can officially notch another accomplishment. Making his professional debut, the Marlins' top prospect allowed one unearned run on one hit and three walks over 4 2/3 innings in Class A Greensboro's 4-3 win over Rome in front of 7,399 at First National Bank Field. He struck out four before being lifted. "It was awesome," Garrett said of his first pro start. "It feels like I'd been waiting for so long, but to get out there again was awesome. All the kids that were here [on field trips] were impressively loud too, which made things a lot of fun." The 19-year-old retired Anfernee Seymour on a flyout to right and Randy Ventura on a groundout to open the first before allowing the lone hit on a single by Cristian Pache. Garrett closed the inning by getting cleanup hitter Tanner Murphy to strike out swinging. The left-hander's most difficult inning came in the third when a walk and two errors by the Grasshoppers infielders let Rome score an unearned run. Garrett recorded two outs and allowed Kurt Hoekstra to reach on another error by first baseman Eric Gutierrez before reaching his 75-pitch limit. The 6-foot-3 hurler was sitting around 91-93 mph with his fastball in the first while showing his plus curveball and changeup, according to Baseball America's Josh Norris, who was in attendance. Though the performance was solid, Garrett said there's plenty to work on in his second outing. "Today, I was working from behind a lot," he said. "I was a little inconsistent with my fastball and could've gotten through some of my innings quicker. It's obviously harder to pitch from behind, but I don't think I was hit too hard today. When I leave balls up, I'm going to get punished, I know that, but I did a good job of keeping balls down for the most part. And the three walks, I don't want those either. So, there's a lot to work on." Garrett's road has been longer than the traditional one for pitchers of his caliber. Miami did not let him pitch in the Minors last summer, following his senior-year workload at Florence, before allowing him to take the mound during instructional league play in the fall. 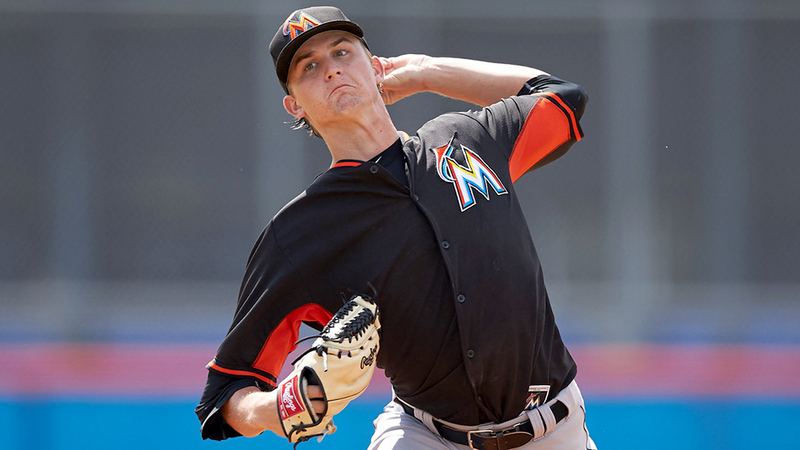 The Marlins held him back again this spring, telling him they wanted to see improvement in three key areas before letting him loose in the South Atlantic League. "Working on the changeup was a big one," he said. "My changeup has gotten a lot better since I started focusing on it. I didn't throw that many today because I was behind a lot. It's something I like throwing when I'm ahead, and I'm not comfortable enough with it yet to use it that way but it's getting there. They also wanted me to work on my stretch delivery and getting the arm out early. I felt like I'd be able to get out of extended as quick as I hit those benchmarks, and I'm still working on those here." Although Garrett didn't bring it up, the Marlins might be taking a conservative approach with their latest first-round pick after they allowed 2014 No. 2 overall pick Tyler Kolek to pitch 108 2/3 innings at Greensboro in his first full season out of high school, only to see him require Tommy John surgery. Whatever the decision-making process, Garrett told the team he was looking for some sort of notification that he'd be heading to Greensboro so he could inform his family in Alabama. Last Wednesday, Garrett got the heads-up he needed, and over the weekend, his father Steve -- who coached him in high school -- stepmother, brother and two baby sisters traveled nine hours by car to see his pro debut. They saw a successful one, and now it's on MLB.com's No. 37 overall prospect to take the next step. "I'm just happy to be competing again, really," he said. "The four days between starts are the worst because being on the mound is the highest of highs for me. I want to be better. ... I'll learn from today, like the way working from behind was my biggest flaw. But really, I was happy with the way I threw. Throwing in front of 7,000 people like that. It was a good day."